Where was the resort you stayed in? I enjoyed every part of it, the bartenders remembered us, the food was good, plenty of restaurants to go to and eat at, so many things were with in walking distance from the resort. The only thing i found not the greatest, well i can't think of much actually, i found it super pleasant! Oh wait there is 1 thing, watch out for people dressed like the employess, asking if you want a free breakfast, they are promoting time shares! DON'T fall for it we did and it took 3-4 hours of our day, it sounds great, but unless you travel every year! and have the money, it's not worth it! Everyone, it's a great all inclusive vacation for families, couples, anyone wanting to have a great time! Grand Oasis Cancun (now called Be Live Cancun) gets a 62% approval rating from previous guests to read more detailed reviews and check prices for the Grand Oasis Resort in Cancun check out TripAdvisor Reviews for the Grand Oasis. 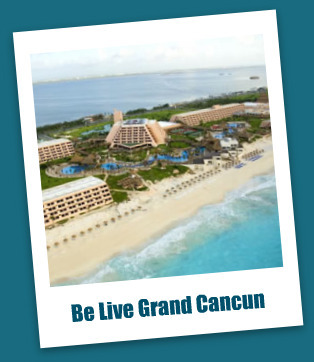 Not sure Cancun is for you - check out our Cancun all inclusive resorts page to help you decide!